The jit.bfg object evaluates and exposes a library of procedural basis functions. Each of these basis functions can be evaluated in any number of dimensions, across any coordinate, without any need of referencing existing calculations. 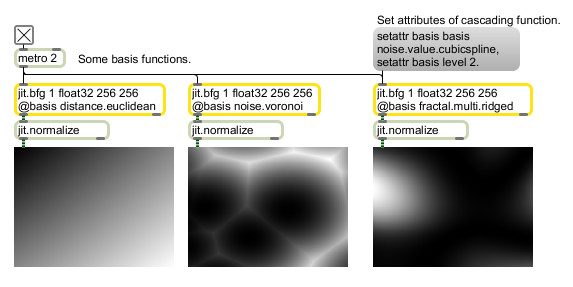 In addition, since they all share a common interface, basis functions can be combined together and evaluated in a function graph by cross-referencing several jit.bfg objects. There are several categories of functions, each of which are characterized by a different intended use. These categories include fractal, noise, filter, transfer, and distance operations. Functions contained in these folders can be passed by name to jit.bfg either fully qualified (category.classname) or relaxed (classname). By default, jit.bfg will generate spatial coordinates across a grid, however, if a jit.matrix is attached to the left-most inlet, the matrix's planar values will instead be used (planar values correspond to dimensions for the coordinates e.g. RGB == XYZ). After creation, jit.bfg requires a basis to be specified before any evaluation will be performed. setattr The word setattr, followed by the name of an attribute and value or list of values, forwards attribute messages on to internal objects (e.g. setattr basis abs 0 would set the basis function object's abs attribute to zero. seed int The seed value to use for initializing the pseudo-random number generator for alignment. The same seed will result in the same output (default = -1138).